London and New York, 12 January 2017 – New investment in clean energy worldwide fell 18% last year to $287.5bn, despite a record year for offshore wind financings, according to the latest authoritative figures from research company Bloomberg New Energy Finance. The 2016 setback in global investment, signaled in advance by weak quarterly figures during the course of last year, partly reflected further sharp falls in equipment prices, particularly in solar photovoltaics. However, there was also a marked cooling in two key markets, China and Japan. Clean energy investment in China in 2016 was $88.2bn, down 26% on the all-time high of $119.1bn reached in 2015, while the equivalent figure for Japan was $22.8bn, down 43%. Justin Wu, head of Asia for BNEF, said: “After years of record-breaking investment driven by some of the world’s most generous feed-in tariffs, China and Japan are cutting back on building new large-scale projects and shifting towards digesting the capacity they have already put in place. Offshore wind was the brightest spot in the global clean energy investment picture in 2016. Capital spending commitments to this technology hit $30bn in 2016, up 41% on the previous year, as developers took advantage of improved economics, resulting from bigger turbines and better construction knowhow. Last year’s record offshore wind tally included the go-ahead for the largest ever project, Dong Energy’s 1.2GW Hornsea array off the UK coast, at a cost of $5.7bn – plus 14 other parks of more than 100MW, worth anywhere between $391m and $3.9bn, in British, German, Belgian, Danish and Chinese waters. Even though overall investment in clean energy was down in 2016, the total capacity installed was not. Estimates from BNEF’s analysis teams are that a record 73GW of solar were added last year, up from 56GW in 2015, plus 56.5GW of wind, down from 63GW but the second-highest figure ever. Clean energy investment in the US slipped 7% to $58.8bn, as developers took time to progress wind and solar projects eligible for the tax credits that were extended by Congress in December 2015. Canada was down 46% at $2.4bn. Investment in the whole Asia-Pacific region including India and China fell 26% to $134.5bn, some 47% of the world total. India was almost level with 2015, at $9.7bn, with several giant solar photovoltaic plants going ahead. Europe was up 3% at $71.2bn, helped by offshore wind and also by the biggest onshore wind project ever financed – the 1GW, $1.3bn Fosen complex in Norway. The UK led the European field for the third successive year, with investment of $26bn, up 2%, while Germany was second at $15.3bn, down 16%. France got $3.6bn, down 5%, and Belgium $3bn, up 179%, while Denmark was 102% higher at $2.7bn, Sweden up 85% at $2bn and Italy up 11% at $2.3bn. Among developing nations, many saw investment slip as projects that won capacity in renewable energy auctions during 2016 did not secure finance before the year-end. Investment in South Africa fell 76% to $919m, while that in Chile dropped 80% to $826m, Mexico fell 59% to $1bn and Uruguay 74% to $433m. Brazil edged down 4% to $6.9bn. One of the emerging markets to go the other way was Jordan, which broke the $1bn barrier for the first time, its clean energy investment increasing 147% to $1.2bn in 2016. The biggest category of investment in clean energy in 2016 was, as usual, asset finance of utility-scale renewable energy projects. This totalled $187.1bn last year, down 21% on 2015. The biggest seven financings were all in offshore wind in Europe, but there were also large deals in Chinese offshore wind (the Hebei Laoting Putidao array, at 300MW and an estimated $810m), in solar thermal (the 110MW, $805m Ashalim II Negev plant in Israel), solar PV (the 580MW, 31 Dominion SBL Portfolio in the US, at an estimated $702m), biomass (the 299MW, $841m Tees project in the UK) and geothermal (the ENDE Laguna Colorada installation in Bolivia, at 100MW and $612m). Among other categories of investment, small-scale projects of less than 1MW – including rooftop PV – attracted 28% less investment than the previous year, the 2016 total finishing at $39.8bn. Most of this year-on-year drop reflected falling costs of solar systems rather than a decline in interest from buyers. Public markets investment in quoted clean energy companies was $12.1bn in 2016, down 21%. Most cash was raised by Innogy, the renewable power offshoot of German utility RWE, which secured just over $2.2bn of new money in an initial public offering, and BYD, the Chinese electric vehicle maker, which took just under $2.2bn via a secondary share issue. Venture capital and private equity investment in clean energy firms rose 19% to $7.5bn, with the largest rounds coming from two Chinese electric vehicle businesses, Le Holdings and WM Motor Technology, raising $1.1bn and $1bn respectively. US solar developer Sunnova took the third most, at $300m. Corporate research and development spending on clean energy fell 21% to $13.4bn, while government R&D moved up 8% to $14.4bn. Last but not least, asset finance of energy smart technologies surged 68% last year to $16bn, helped by a jump in global smart meter spending, from 8.8bn in 2015, to $14.4bn. Taking all categories of investment into account, solar was the leading sector once again, at $113.7bn, but this was 34% down on 2015 levels, due in large part to lower costs per MW. Wind saw $112.5bn invested, down 9%, while energy smart technologies attracted $41.6bn, up 29%, biomass was more or less level on 2015 at $6.8bn, and biofuels secured just $2.2bn, down 37%. Small hydro showed no change in investment at $3.5bn, while low-carbon services attracted $4.3bn, up 5%, geothermal $2.7bn, up 17%, and marine energy $194m, down 7%. 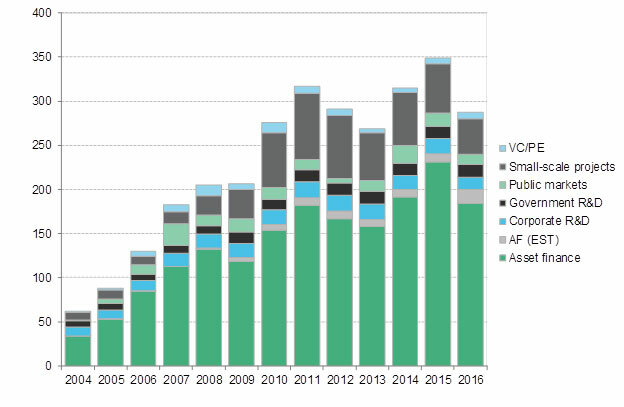 Also measured by BNEF, but not included in the figures for new investment, is acquisition activity in clean energy. This totaled $117.5bn in 2016, up from $97bn in 2015 and the first time this has broken the $100bn level. Behind the surge were a rise in renewable energy project acquisitions to $72.7bn and, in particular, a 63% leap in corporate M&A to $33bn. The top takeovers included Tesla’s acquisition of SolarCity for $4.9bn and Enel’s buy-back of the minority holders in Enel Green Power for $3.5bn. Source: Bloomberg New Energy Finance. Note: In this chart, asset finance is adjusted for re-invested equity. AF (EST) stands for asset finance of energy smart technologies projects, including smart grid, smart meters and energy storage. VC/PE stands for venture capital and private equity. The updated totals for clean energy investment in past years are: $61.7bn in 2004, $88bn in 2005, $129.9bn in 2006, $182.5bn in 2007, $205.2bn in 2008, $206.8bn in 2009, $276.1bn in 2010, $317.5bn in 2011, $290.7bn in 2012, $268.6bn in 2013, $315bn in 2014, $348.5bn in 2015 and $287.5bn in 2016. Excluding large hydro-electric plants of more than 50MW. BNEF will publish a separate estimate for large hydro investment in 2016 in the next few weeks.